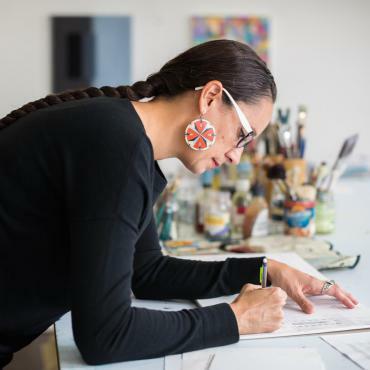 Highpoint Editions Artist Dyani White Hawk has been awarded one of the first Jerome Hill Artist Fellowships. This new program awards 60 early career artists with a two year fellowship to support creation of new work, workspace/studio/rehearsal rental, research, travel, professional development, professional equipment purchase, and residency participation and development of new skills. In her fellowship statement, Dyani writes: “As a woman of Sičangu Lakota and European American ancestry, I was raised within Native and urban American communities. My work reflects these cross-cultural experiences through the combination of modern abstract painting and abstract Lakota art forms. Some works are executed strictly in paint while others incorporate beads and porcupine quillwork onto a painted surface, weaving aesthetics and conceptual influences from each respective history. Newer PostJulie Buffalohead in "The Portrait Show"